2013 should have been the year that Alexei German’s long-awaited sixth film finally appeared. With just five films released in forty-five years as a director, German has long occupied a unique position in film history, comparable only to that of Terrence Malick. His latest, based on a novel by the Strugatskys, almost unbelievably has been in production since 2000. But on 21 February, German’s death was announced. I heard the news while in the Czech Republic, where German apparently shot part of what will now be his last film, and felt an immediate sense of loss, as I recalled how both he and his remarkable oeuvre had entered my life at crucial moments during the last decade of the Soviet era. 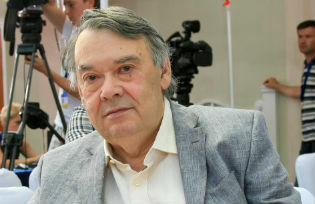 German was born in 1938 and actually began directing in 1968, but as with others of his generation – like Aleksandr Askoldov and Kira Muratova – his early work was either buried or ‘shelved’, as the saying went. My first encounter came in 1984, when the Soviet Filmmakers Union invited me to assemble a delegation of British ‘independent’ filmmakers, so that they could see at first hand the kind of avant-garde work that never reached official platforms such as the Moscow Film Festival. Our little group included the filmmakers Sally Potter and Derek Jarman, neither as well known as they would become, along with Ed Bennett, Peter Wollen and Peter Sainsbury from the British Film Institute Production Board. Among the films the Union offered to show us was German’s Twenty Days Without War, which had been made in 1977 but never seen abroad. Jarman, who was shooting clandestinely what would become his Imagining October, was deeply impressed by this understated, melancholic reflection on the heightened realities of wartime life on the home front. The world-weary war reporter on leave from Stalingrad, we learned was played by Yuri Nikulin, an ex-clown, who was also one of the most popular of screen comedians. His love interest was played by an equally popular actor and singer Ludmilla Gurchenko; but oblivious to this casting against reputation, we only knew we had seen something of extraordinary integrity in the burnished black-and-white that German always used. One year on, the Moscow Film Festival of 1985 would prove to be a milestone in the transformation of the USSR. The most controversial competition film by far was Elem Klimov’s Come and See, a ferocious vision of the partisan war against the Nazis in Belorussia that took first prize – a harbinger of the revolution within Soviet cinema that would soon put the previously banned director Elem Klimov in the forefront of Gorbachev’s reforms as first secretary of the Union. But during the festival, a discreet invitation went out to selected visitors that there would be an unannounced screening. A bus took us to a remote cinema and, without explanation, we found ourselves watching an unsubtitled print of German’s masterpiece, My Friend Ivan Lapshin. I was lucky, because my interpreter knew the work of the popular writer Yuri German, Alexei’s father, on whose stories the film is based. All around us, interpreters and puzzled festival visitors were struggling to make sense of this subtly disconcerting film. Set in a communal apartment in a small Volga town in 1935, on the eve of a catastrophe that none of its characters could anticipate, the film has a double viewpoint: that of an adult narrator, seen in colour at the beginning, who tells us that the film is ‘a declaration of love for the people I grew up with as a child’, but mostly it is seen through the eyes of the same character as a youngster, living with his father in this warm, yet volatile community, which includes the local police chief, Lapshin. The dramas that punctuate this ramshackle household include a police hunt for local bandits trading in illegal meat, an attempted suicide, and the ungainly Lapshin falling vainly in love with an actress in a touring company. Even on a first viewing, German’s desire to reveal the positive aspects of this period was obvious: for all the brutality of the police raid and the irony of Lapshin’s declaration that he is optimistic about ‘building communism’, this is a group portrait of members of a naïve yet idealistic generation, some of whom at least gained strength from communal living. Was it in some sense a ‘whitewash’? Such accusations would surface when the film appeared at international festivals in 1986, on the crest of the first wave of glasnost. Audiences expecting a denunciation of Stalinism, such as Tengiz Abuladze’s contemporary film Repentance delivered, were perplexed. And when Ivan Lapshin was shown on Soviet television during Gorbachev’s perestroika, the director ruefully recalled that at least two thirds of the audience were horrified. In retrospect, both reactions are surprising, although it is easy to forget how totally unprecedented the subtlety of Lapshin was. The child’s point of view on relationships among the adults allowed German to avoid any heavy-handed hindsight, without also seeming to exonerate these characters who may go on to do shameful things during the impending Terror of 1937-8. The complacent Soviet citizens who were disturbed by the film’s unheroic portrayal of daily life under Stalin would of course be increasingly aghast as perestroika ratcheted up the level of criticism and derision towards the Soviet past. German did not intervene in that period, although his Trial on the Road, made and immediately banned in 1971, was released in 1986 as part of the wave of ‘unshelved’ films that helped bring Gorbachev’s message to an expectant world. Like Lapshin, the film’s subversion needed decoding. Why should a Red Army soldier who had escaped from German captivity not be allowed to prove his loyalty by undertaking a dangerous mission on behalf of the Soviet partisans? The answer lay in Stalin’s ruthless murder of Red Army POWs, never previously discussed in Soviet cinema, but here deflected into a struggle between a diehard partisan officer and an escaped soldier desperately trying to clear his reputation. To a Soviet audience who knew well the scale of self-inflicted loss, this spoke volumes. In October 1991, the USSR set aside a long history of hostility to Israel and established diplomatic relations for the first time. Lia and Wim van Leer, the heroic founders of the Jerusalem Cinematheque had already hosted visits by Soviet filmmakers, and were now determined to profit from the new, potentially short-lived, easing in relations. Since I had been bringing Russian filmmakers regularly to Britain, Lia asked me to help organise a similar visit to Israel. To my intense surprise, having suggested German, I discovered that he was indeed coming, along with another Leningrad director, Konstantin Lopushansky. And so, for a week, we fielded questions in Jerusalem, trying to explain the convoluted politics of Soviet cinema, and its new-found freedom. We also tried to pack in as much sight-seeing as we could manage. Like all first-time visitors to Israel, we were constantly struck by the overlay of past and present, as we followed the course of Herod’s original irrigation canal on our way to visit the fortress of Masada and sample the slimy novelty of floating in the Dead Sea. The dramatic course of current politics had made possible this visit, and most Soviet filmmakers at this time could hardly believe their luck in being able to travel abroad. Another member of the Russian party was the screenwriter Alexander Chervinsky, who had scripted one of the notoriously banned films, Gleb Panfilov’s The Theme (made in 1979, but only seen in 1987), in which a writer suffers persecution for wanting to emigrate to Israel. German’s mother was apparently Jewish, and he particularly wanted to meet Russian Jews as they arrived in Israel, following Gorbachev’s recent lifting of emigration restrictions. But he soon discovered that ‘aliyah’ (return) was a highly controlled affair, and there were some limits to what even Wim and Lia could organise. The first Palestinian Intifada then in force meant that the daily curfew constrained our movements within Jerusalem, reminding us of current tensions, to which the Russians seemed largely oblivious. But they were still living though their own revolution and, like the characters in German’s two great films, had no inkling of what lay ahead. Within a year, the Soviet Union itself would disintegrate. I never managed to bring German to London, or to visit him in the city that reverted to being called Saint Petersburg in 1991. And it would be a further seven years before German released his extraordinary journey through the paranoid world of late Stalinism, Khrustalyov, My Car! (1998), already under way when we were in Israel and, like all his films, co-scripted with his wife Svetlana Karmalita. The title comes from Lavrentii Beria’s reported order to a servant, after witnessing Stalin’s death, and the central character is a military surgeon, who becomes caught up in the escalating frenzy around the dying dictator that is still known, absurdly, as the ‘Doctors’ Plot’. After its poorly received Cannes debut, the film acquired a reputation of impenetrability; and despite its kaleidoscopically brilliant recreation of every level of Stalinist society, from the high society in which the surgeon initially moves, to the sinister world of black limousines, and the brutality of the hellish labour camps that he enters and survives, it has never enjoyed the same admiration as Lapshin. The film on which German was working up to his death seems to mark a sharp departure from his previous immersion in the Stalin era. Based on one of the Strugatskys’ science-fiction ‘Noon’ novels, Hard to Be a God (1964), its main characters are observers from earth living secretly on another planet where society is still at a brutally medieval stage, and they are expected to intervene only in limited ways to influence its future history. From stills and footage that appeared last year, it bears some resemblance to the ragged, desperate world of Tarkovsky’s Andrei Rublev (Tarkovsky’s Stalker was also a Strugatsky adaptation, as was Aleksandr Sokurov’s Days of the Eclipse). No doubt The History of the Arkanar Massacre, as it is known to distinguish it from an earlier, unauthorised adaptation of the novel, will shortly appear. But sadly now as a memorial to the uncompromising filmmaker of textures and tones rather than narratives, whom many Russians will mourn as their greatest modern master. Ian Christie is a film historian, curator, broadcaster and consultant. He is also Professor of Film and Media History at Birkbeck College, University of London.